“I feel God calling me to religious life, but I don’t know many sisters. Where do I begin?” Those were the panicked thoughts that raced through my head when I began seriously discerning a religious vocation during my time as a student at Eastern Illinois University. God had been whispering to my heart for several years, but as a teenager, I chose to ignore Him. However, God never abandoned my call, and as I prepared for graduation and making the next good step in my life, I knew I had to actually spend some genuine time in discernment. So like any good college student, I “Googled” what to do. God didn’t take too long to get busy, and before I knew it, a friend of mine was writing a play about the founding of the Society of St. Vincent de Paul. He was advertising for talent at our Newman Catholic Center, and was very insistent that I audition for a part in the play. Although I was a senior in college at this point, and definitely had enough responsibilities to occupy my time, I agreed to try out for a part in the play. After auditions the cast list appeared with the roles, and there I saw my name next to “Sister Rosalie Rendu.” I was casted as a Sister, and not just any Sister, a Daughter of Charity! I had been in communication with this community for several months and made a visit with them, but their charism was service to the Poor, and I wasn’t sure if that was something I was called to do. I decided to do some research about my real life character to better understand my role in the play. University Newman Catholic Center in Charleston, Illinois. As the story goes, Frederic Ozanam was a young college student who felt the burning desire to serve the Poor in his community, however, when he showed up in a neighborhood where he wasn’t accustomed to visiting, wearing a top hat and innocent smile, the local people did not trust him and drove him out of the neighborhood. 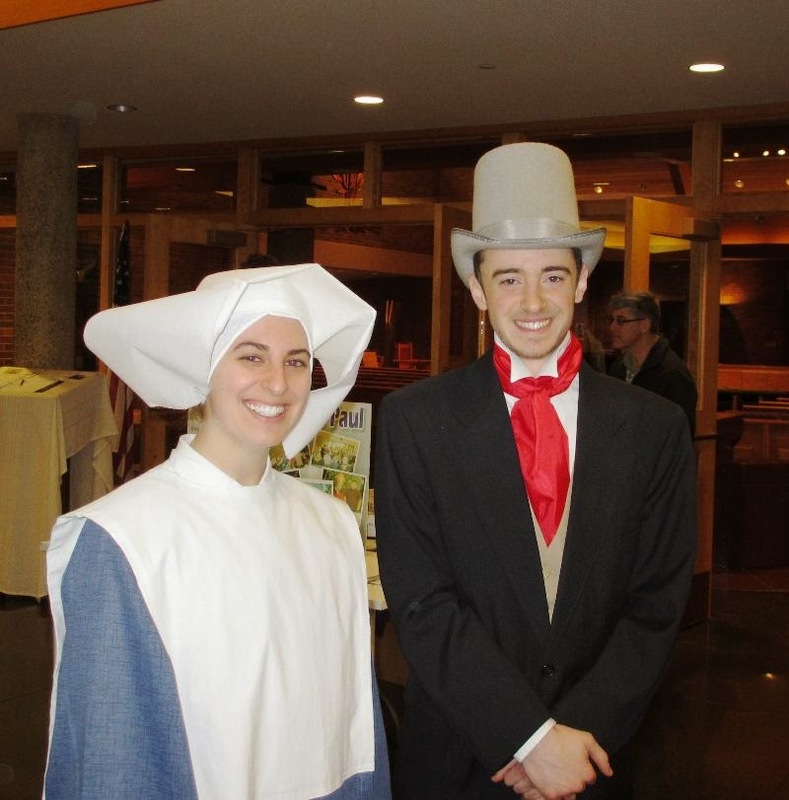 Frederic was young and willing to serve, but he didn’t know what that looked like for him exactly, so his mentor brought him to Sister Rosalie to learn how one must serve the Poor. So again, I told God, “If this is what you want, then make it happen,” and again, God handed me a grace-filled opportunity to fall in love with Christ in the Poor. The St. Hedwig Haus of Hospitality was in need of a Resident Catholic Worker, and I had decided to stick around Charleston for graduate school, studying speech-language pathology. I didn’t have any housing plans yet, so I was invited to pray about living at the Catholic Worker House. I immediately dismissed the idea and filled my head with numerous excuses. I knew that living at Hedwig would be challenging, and I knew that living at Hedwig would be distracting from my studies. However, in my discernment, I couldn’t stop thinking about Sister Rosalie’s message about love. What if love could consume all the messiness, challenges, and distractions? of Hospitality in Charleston, Illinois. I committed to living at the St. Hedwig Haus for about a year, and I will say it was the most challenging experience of my life, but also the most grace-filled. I lived in a house with women and their children who were in need of a home supported by a loving community. Of course there were moments of heartbreak and times I questioned if this was really where God wanted me to be, but then I remembered Sister Rosalie’s words, “All you must do is be kind and love…” and eventually I was able recognize Christ as a regular guest at the Haus. My experience at Hedwig helped me to discover my call to give myself to Christ in the Poor, and ultimately guided me towards the Daughters of Charity of St. Vincent de Paul. Currently, I am a Pre-Postulant in the community, living in New Orleans, LA. This is the first stage of formation, and includes living with the Sisters, praying with the Sisters, and even going to Mardi Gras parades with the Sisters. Throughout my nine months with the community, I have received affirmations that this is indeed what God wants for me, and He is making it happen one day at a time. Discernment may feel like a race, but if you take the time to embrace the journey, God’s whispers will powerfully resonate within you, guiding the next good step. Beautiful Kara! Thank you for sharing your journey.